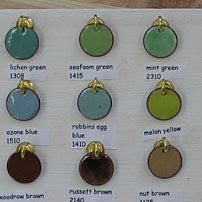 This post is about a recent moment of organizational genius that my wife Anat had in her enameling studio. This sample board holds sample firings of some of the colors she uses. Each sample was fired on a uniform size penny (pre-1980) with a large hole punched in it. The samples are hung on hooks on a board painted a simple white. Each sample is labeled with it's color and number. The labels were typed up on a document and then printed, cut out and taped onto the board - less expensive than using a label maker. Anat measured the pennies and divided that into the length of the board to figure out the spacing for each row. She marked the locations for the hooks and made holes before painting. Then she painted the board and screwed in the brass hooks - find a size with a gauge that matches the hole. And it's a beautiful solution! So pretty how they hang and catch the light. It makes it so easy to see the colors to choose for a project, even to take them off the hooks to compare side by side. My suggestion, as an organizational freak, is to label the back of each sample with its matching number, with a label machine, to make putting them back simple to do. How do you organize your enamels or colors for your medium? Brilliant solution to a vexing problem! Thanks Anat!